The original holding tank was metal and had some corrosion so we had a plastic one made up by a local firm. This means we can now enter in to any marina legally and use the holding tank should we use the toilet on board, but we have yet to work out all the piping for the rear heads! With shower and sink pumps, filters and overflow floats and a spaghetti of pipes we’ve had to draw a map of what each component does. At our launch party the rear heads actually overflowed, leaving us 5cm of water to pump out (very quickly). At the time it was drunkenly concluded that the holding tank was full and was overflowing, but we later worked out that someone had not switched the toilet pump from ‘flush’ to ‘off’. A common school-boy error which we’re all guilty of, but since boats have been sunk in the past due to this oversight it was a sharp reminder to always bear this in mind. We figured we should change the electronic pump back to a manual one since this was an unnecessary drain on the battery bank. It wasn’t until we had done this that someone pointed out that electric flushes use less water, a useful consideration if using the holding tank. Even so, we’ve had some bad experiences with electronic flushing systems in the past. 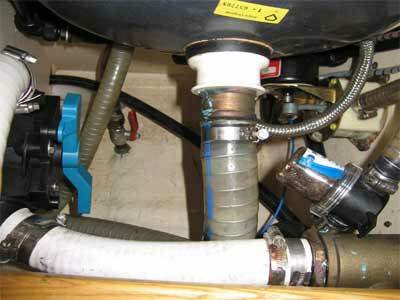 Get water into that little bit of kit and your loo could be flushing all night due to a short circuit. Believe us, it’s happened!